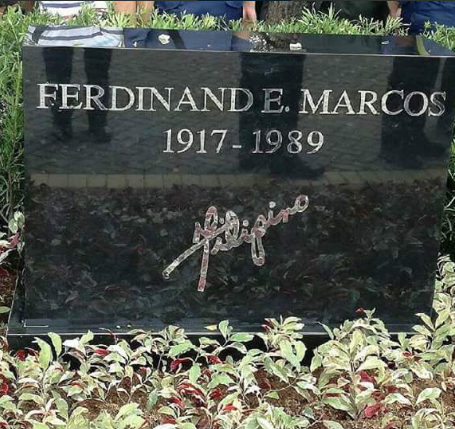 Many protesters were taken by surprise when they learned that former President Ferdinand Marcos would be buried at 12 noon on November 18 at the Libingan ng Mga Bayani. The sudden burial saddened a lot of human rights activists and also received a lot of condemnation from those opposed to the burial. That includes no less than Vice President Leni Robredo, who issued a strongly worded statement calling Marcos "a thief, a murderer, and a dictator". VP Leni said that the Marcoses "flouted the law" when it persisted in burying Marcos earlier than expected. The decision to allow the burial of the former president at the Libingan ng Mga Bayani was handed down by the Supreme Court on November 8. Based on the laws of the land, that decision should only be final and executory 15 days after. A lot of groups were set to file an appeal regarding the Supreme Court ruling favoring the Marcoses, but it seems that would just be water under the bridge. According to some, the burial can proceed in the absence of a restraining order. The general public were not allowed inside the Libingan ng Mga Bayani. Even members of the press were not allowed inside the LNMB. But according to them, military honors were accorded to Marcos, including a 21-gun salute. 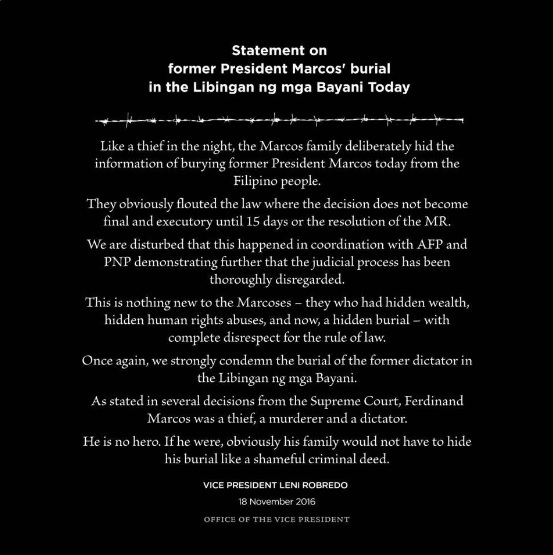 Like a thief in the night, the Marcos family deliberately hid the information of burying former President Marcos today from the Filipino people. They obviously flouted the law where the decision does not become final and executory until 15 days or the resolution of the MR.
We are disturbed that this happened in coordination with AFP and PNP demonstrating further that the judicial process has been thoroughly disregarded. This is nothing new to the Marcoses – they who had hidden wealth, hidden human rights abuses, and now, a hidden burial – with complete disrespect for the rule of law. Once again, we strongly condemn the burial of the former dictator in the Libingan ng mga Bayani. As stated in several decisions from the Supreme Court, Ferdinand Marcos was a thief, a murderer and a dictator. He is no hero. If he were, obviously his family would not have to hide his burial like a shameful criminal deed." The Marcos burial takes centerstage once more on social media as 8 out of the top 20 trending topics on Twitter tackled the issue, with hashtag #MarcosNOTaHero topping the list.